In my post on May 16 I talked about something I wanted badly but have so far never used: my Paperblanks Silver Filigree Pink Blush journals. I have used the small one but not the big one. I really thought I had talked about them before but couldn’t find a post about them so here goes. I first saw them on lovenotebooks.com and instantly fell in love. I thought they looked medieval and romantic. I went to one of my favorite journal stores, Paper Root Studio, and picked up the 3.5×7 Slim Journal, which is the smaller of the two pictured. 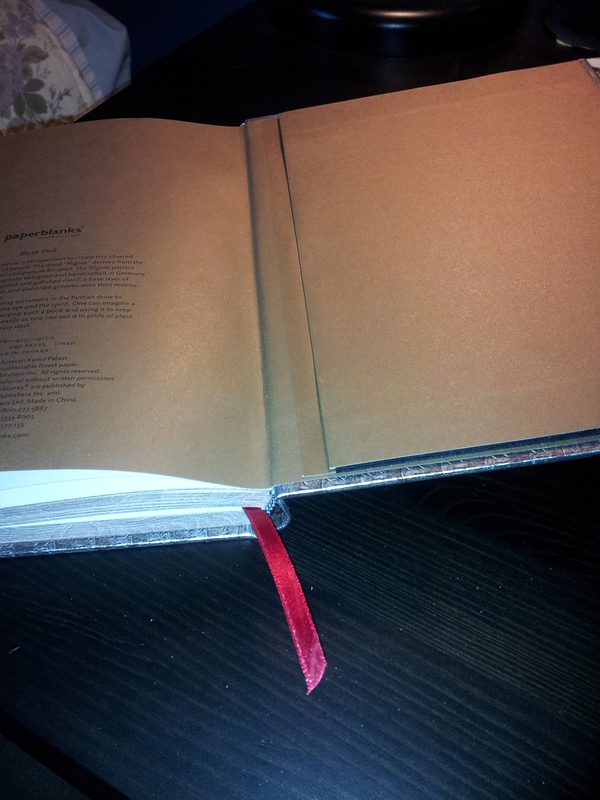 The Slim Journal has a single clasp that I love. I use this daily to record my tea drinking. With frequent use the clasp no longer stays upright. I happened to be walking by the Hallmark store in my neighborhood and spied the 7×9 Ultra Journal in the window. I rushed in and rushed out with it, oblivious to the cost (it was less than $30 but barely). I have yet to find a use for it. 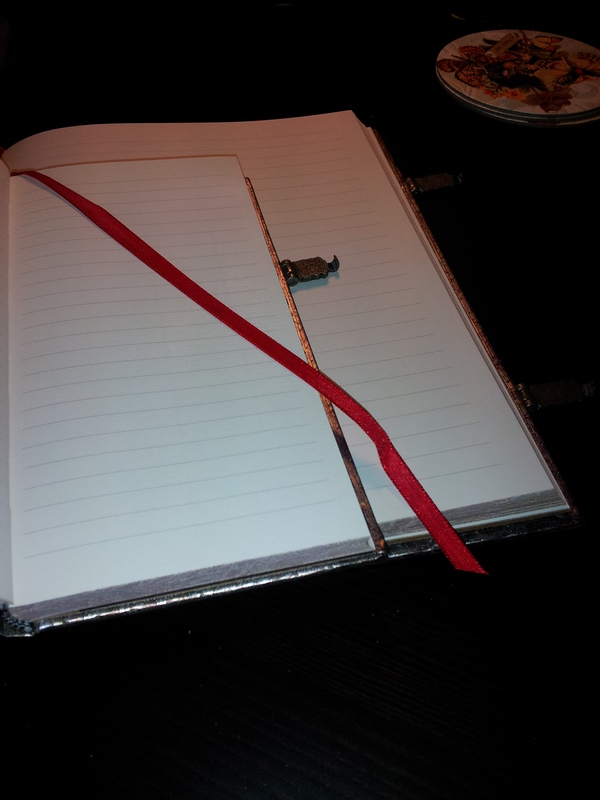 I have started to write in it, thinking it could become my new daily journal, but I just can’t! It’s too beautiful somehow; I just can’t bring myself to do it. Silly I know but it’s the truth. The Ultra Journal shown above has two clasps. Daily use will probably have the same effect as on the smaller one. I love the marbling on the page edges. The inside covers are covered in a plain goldish-toned paper. 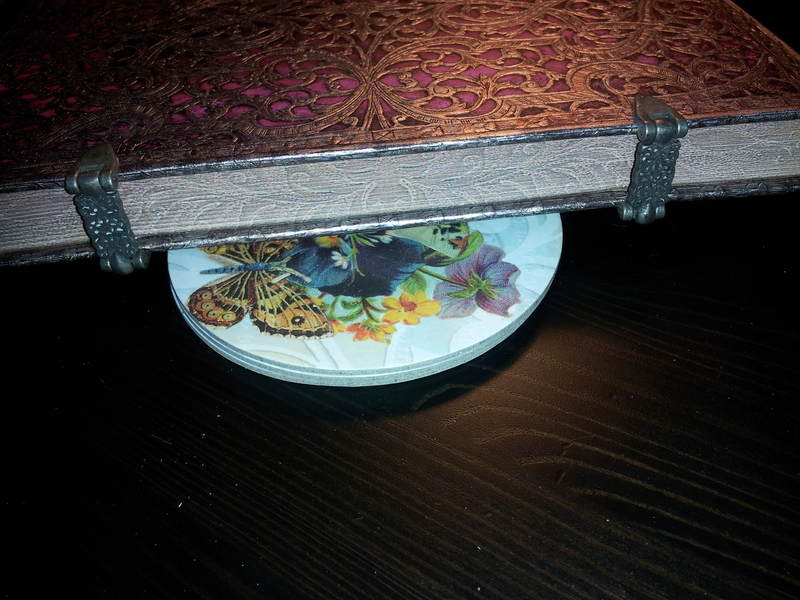 Both notebooks lie flat, which is great. 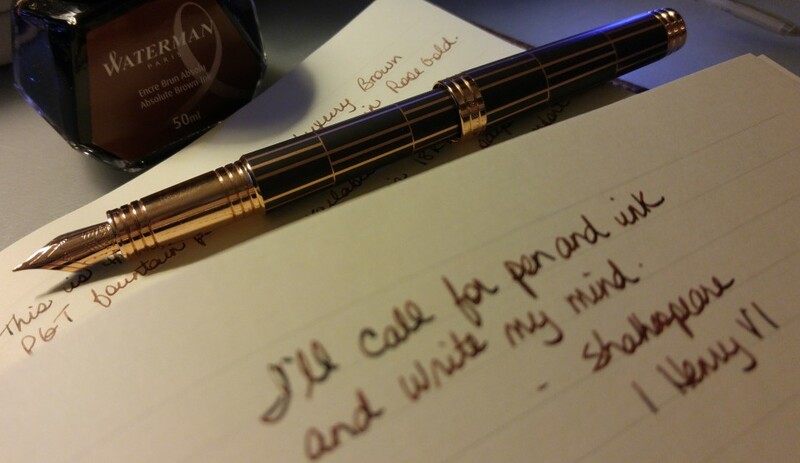 The paper is more white than cream and takes fountain pen ink beautifully. 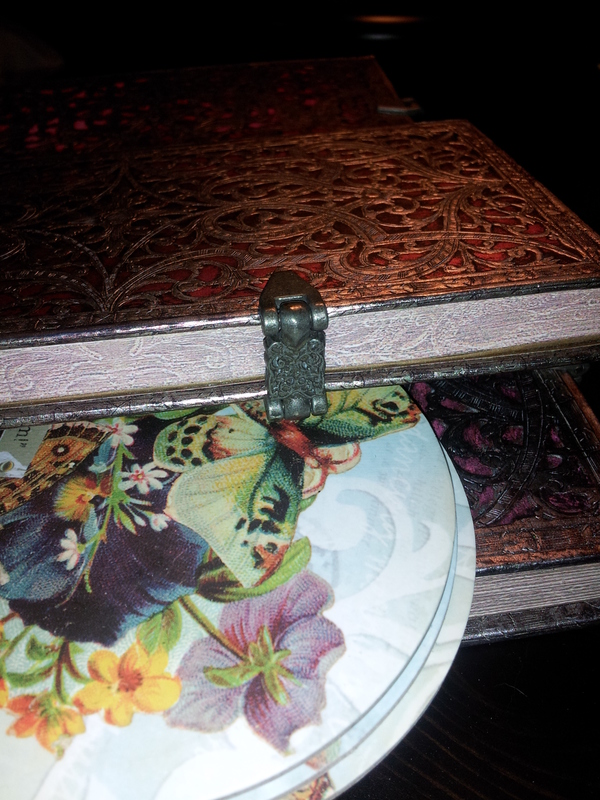 I must admit I was disappointed with the opened notebook; I thought the pages would be decorated in some subtle way. And I don’t know why they thought a red ribbon bookmark would look good! Both notebooks have the same bright red bookmark. Silver or blush pink would have been a much better choice, in my opinion. 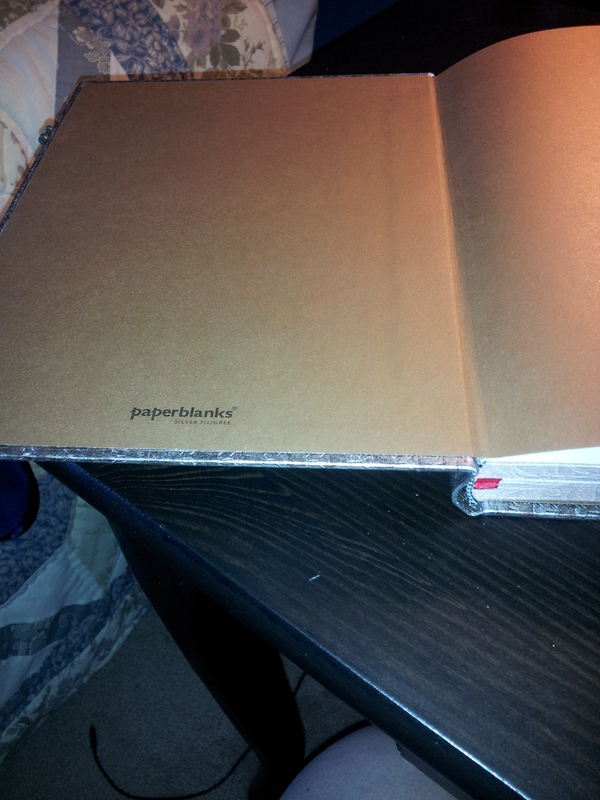 Same end papers, with a pocket for loose pages. Even though I hate the ribbon bookmark I am still (and will be for a long time I’m sure) in love with these notebooks. Paperblanks has so many beautiful products, be sure to check them out on lovenotebooks.com or your favorite notebook retailer. 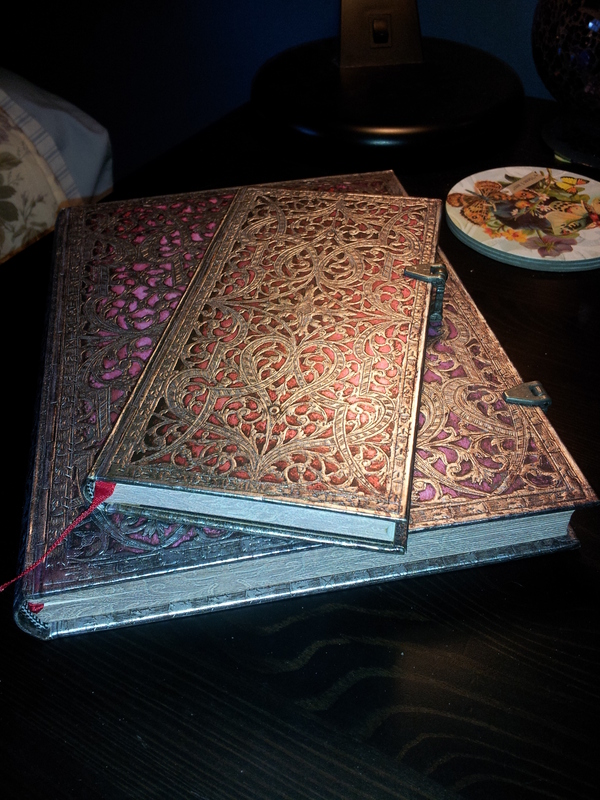 I’ve been drooling over the filigree journals too! Not sure but according to their website the Blush Pink Mini appears to have neither an elastic or a clasp. Odd.